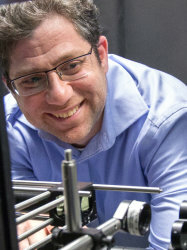 AB  - Recently, there has been a drive to design and develop fully tunable metamaterials for applications ranging from new classes of sensors to superlenses among others. Although advances have been made, tuning and modulating the optical properties in real time remains a challenge. We report on the first realization of a reversible electrotunable liquid mirror based on voltage-controlled self-assembly/disassembly of 16 nm plasmonic nanoparticles at the interface between two immiscible electrolyte solutions. We show that optical properties such as reflectivity and spectral position of the absorption band can be varied in situ within ±0.5 V. This observed effect is in excellent agreement with theoretical calculations corresponding to the change in average interparticle spacing. This electrochemical fully tunable nanoplasmonic platform can be switched from a highly reflective 'mirror' to a transmissive 'window' and back again. This study opens a route towards realization of such platforms in future micro/nanoscale electrochemical cells, enabling the creation of tunable plasmonic metamaterials. TI  - Electrotunable nanoplasmonic liquid mirror.